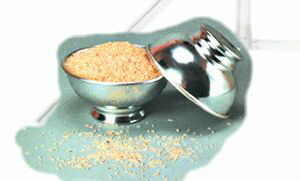 The Rice Bowls are one of the oldest of magic effects, presumably of Chinese origin. In effect, the performer shows two empty bowls. One of these are filled to the brim with rice and covered with the other. When uncovered the rice has magically doubled in quantity, overflowing the Bowl. The Bowl is now emptied out, and the empty Bowls are placed together again. When separated the Bowls are found filled with water that is poured back and forth from bowl to bowl increasing in quantity. Our Bowls are specially machine made, spun Aluminum, light weight, self-contained and require no additional fake as in the old version. Approximately 3½ inches high and 6½ in diameter these bowls look great. Supplied with detailed instructions and presentation ideas.